Video Kiosk supports Split Screen Mode, which divides the playback screen into 4 areas, A, B, C and D, allowing you to play your content loop in area A, while you run standard Android app widgets and/or web URL based content in areas B, C, and D.
If you haven’t already done so, enable Split Screen Widget Mode. Video Kiosk will re-launch and display a 4-panel split screen, with the default layout and the default display. Configure Video Kiosk Areas B, C and D with which widgets | URLs to display. and select and configure the widget(s) and URL(s) to display. Each widget area of the split screen can display multiple app widgets and/or web URL rendered content. The web URL can be any valid protocol including http://, https:// (remote content) and file:// (local content). Add any other widgets and/or web URLs to be displayed in that area. Optionally, enter the amount of time, if it is different than the default value, to display it in minutes. Optionally, configure the “Monitor Internet” feature. If your widgets are dependent on the Internet, they may behave in an unexpected manner if Internet connection is lost. You can configure Video Kiosk to monitor the Internet and return to full screen mode when Internet connection is lost. To enable this feature, go to Video Kiosk Settings > Widgets > Monitor Internet, and tick the box. Video Kiosk will display full screen. Video Kiosk includes a set of built-in widgets. These include Date and Time, Image Folder, URL, and RSS widgets. When you pick a built-in widget, the settings for that widget is displayed. You can configure the widget using these settings or using an XML file. For more information about using an XML file, refer to Appendix C – Built in Widget XML Settings. Use the Date and Time widget to display the Date and / or the Time and an optional group of images from a folder. When you pick the widget, the settings will be displayed. Use the Image Folder widget to display a group of images from a folder. When you pick the widget, the settings will be displayed. Use the RSS widget to display a list of RSS News feeds from remote servers. When you pick the widget, the settings will be displayed. You can use the Video Kiosk’s split screen default layout, or you can customize the layout by adding or removing padding between the areas or by changing the size of the widget areas. 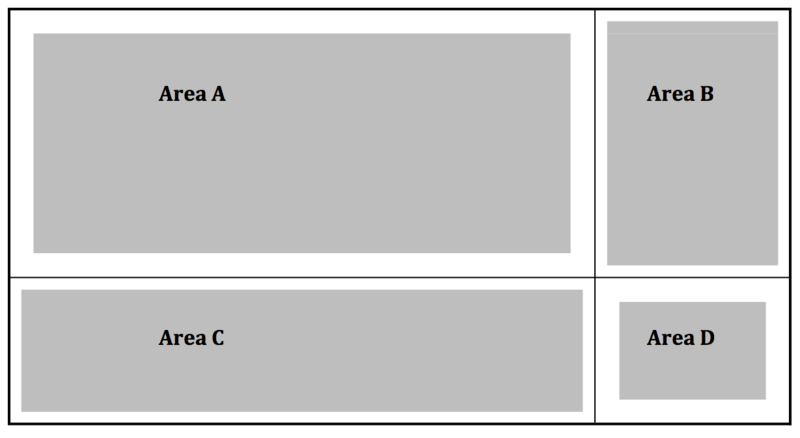 Widget Area Size is the boundaries of the four Areas (Areas A, B, C and D) including the area used by the widget and the padding. By default Video Kiosk assumes a 1080p display in landscape orientation with a screen resolution of 1920×1080. The horizontal weights are 1426 and 494 and the vertical weights are 800 and 280. So on a 1080p display the pixel sizes will be as follows Area A: 1426×800, Area B: 494×800, Area C: 1426×280 and Area D: 494×280. The best way to understand | use the layout weights is to determine the horizontal width and vertical height of your display based on its orientation and then set the weights to the number of pixels that you want in your layout. Video Kiosk Settings > Widgets > Horizontal weights and adjust the horizontal weight for the widget’s area. Video Kiosk Settings > Widgets > Vertical weights and adjust the vertical weight for the widget’s area. Padding is the area between the Widget area boundaries and the sides of the Widget. Each widget area has a default padding amount which allows the background to show through between the widget areas and aligns the widget within the area. If you’d like to change a widget’s placement slightly within it’s area, use the padding feature. Please note that the padding can be both positive and negative. For web URL content, additional padding and formatting may need to be included in the html description of the content. Go to Video Kiosk Settings > Widgets > Area X Padding and adjust the padding in the widget’s area. In this is an example, the split screen is using the default widget area layout and default widget padding.. 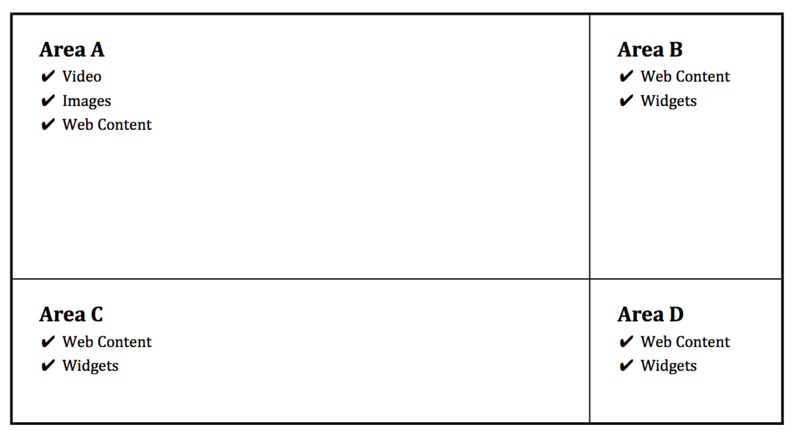 In this example, the split screen is using the default widget area layout and the padding for Area A and Area D have been increased. In this example, the split screen is using the default widget padding. 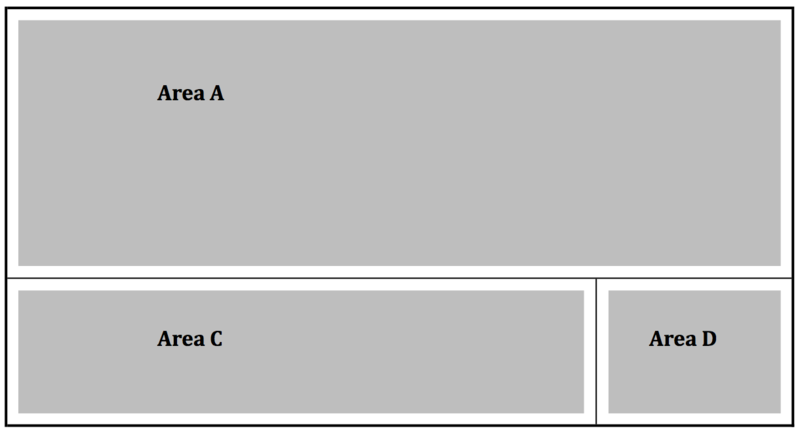 To allow Area A to use the entire width of the screen, the horizontal weight of Area B has been set to O, while the horizontal weight of Area A has been set to the maximum for the screen resolution. Widgets are available from the Google Play Store. You can develop your own widgets and sideload them onto the device. 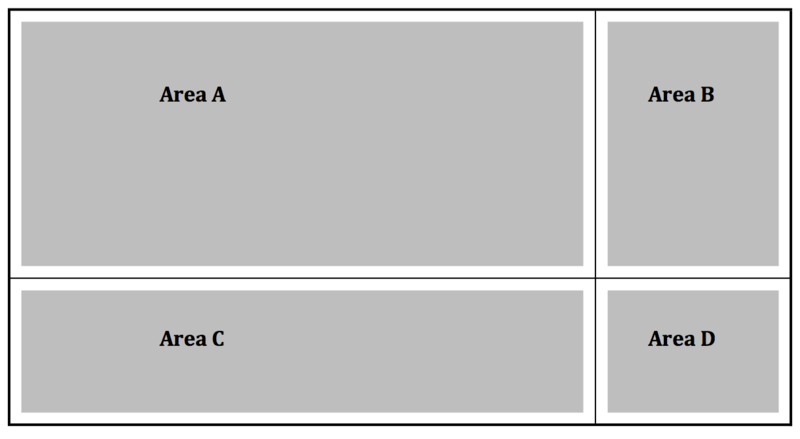 Because Areas B, C and D are of different sizes, you need to give some consideration to how well the widget will be seen when placing the widget in one of the areas. When deciding on which area to place a widget, consider how the widget was intended to be displayed (landscape, portrait or square), the device’s display size (TV or tablet or phone) and how far away the viewer will be from the screen.